If you mention the term "board of directors" to the average investor, he or she may conjure images of nicely dressed men and women sitting around a mahogany table, smiling congenially. This is entirely understandable as many annual reports prominently feature glossy photographs of such a scene. Now, ask that same investor to describe the primary responsibility of the board of directors — e.g., what the individual directors on the board do or the role the board plays in terms of actual involvement in the activities of the firm — and very few will be able to give you a definitive answer. In fact, even though it is of vital importance, the odds are good they won't be able to explain the difference between executive directors and independent directors nor explain why that distinction must be made. Here is a look at the basics you need to know about a corporate board of directors so you feel more comfortable with this governing body whenever you are considering making an investment in your favorite company, either by purchasing shares of stock or buying bonds. Though they have many responsibilities, the primary responsibility of a corporate board of directors is to protect the shareholders' assets and ensure they receive a decent return on their investment. The board of directors owes its shareholders the highest financial duty under American law, known as a fiduciary duty. In some European countries, the sentiment is much different in that many directors there feel that it is their primary responsibility to protect the employees of a company first, the shareholders second. In these social and political climates, corporate profitability takes a back seat the needs of workers. The board of directors is the highest governing authority within the management structure at a corporation or publicly traded business. It is the board's job to select, evaluate, and approve appropriate compensation for the company's chief executive officer (CEO), evaluate the attractiveness of and pay dividends, recommend stock splits, oversee share repurchase programs, approve the company's financial statements, and recommend or strongly discourage acquisitions and mergers. The board is made up of individual men and women (the "directors") who are elected by the shareholders for multiple-year terms. Many companies operate on a rotating system so that only a fraction of the directors are up for election each year. They do this because it makes it much more difficult for a complete board change to take place due to a hostile takeover. In most cases, directors either, 1.) have a vested interest in the company, 2.) work in the upper management of the company (so-called "executive directors"), or 3.) are independent of the company but are known for their business abilities. It isn't unusual for directors to be tied to major vendors to strengthen important relationships. For example, you'd expect to see a high-ranking employee of The Coca-Cola Company on the Board of Directors at McDonald's Corporation or vice versa given their mutually beneficial relationship. The number of directors can vary substantially between companies. The Walt Disney Company, to provide one illustration, has sixteen directors, each of whom are elected at the same time for one-year terms. Tiffany & Company, on the other hand, has only eight directors on its board. In the United States, at least fifty percent of the directors must meet the requirements of "independence", meaning they are not associated with or employed by the company. In theory, independent directors will not be subject to pressure, and therefore are more likely to act in the shareholders' interests when those interests run counter to those of entrenched management. The responsibilities of the board of directors include the establishment of the audit and compensation committees. The audit committee is responsible for ensuring that the company's financial statements and reports are accurate and use fair and reasonable estimates. The board members select, hire and work with an outside auditing firm. The firm is the entity that actually does the auditing. The compensation committee sets base compensation, stock option awards, and incentive bonuses for the company's executives, including the CEO. In recent years, many boards of directors have come under fire for allowing executives salaries to reach unjustifiably absurd levels. In exchange for providing their services, corporate directors are paid a yearly salary, additional compensation for each meeting they attend, stock options, and various other benefits. The total amount of directorship fees vary from company to company. At the time this was originally written, Tiffany & Company paid its directors an annual retainer of $46,500, an additional annual retainer of $2,500 if the director is also a chairperson of a committee, a per-meeting-attended fee of $2,000 for meetings attended in person, a $500 fee for each meeting attended via telephone, stock options, and retirement benefits. When you consider that many executives sit on multiple boards, it's easy to understand how their directorship fees can reach into the hundreds of thousands of dollars per year. The compensation directors receive, along with any other benefits, short biographical information, age, and level of existing ownership in the business is found in a special document known as the Proxy Statement. Generally, it is considered a good sign to have directors with substantial ownership stakes in the business under their care because they truly walk in the shoes of the outside shareholders in many respects. The particular ownership structure of a corporation has a huge impact on the effectiveness of the board of directors to govern. In a company where a large, single shareholder exists, that entity or individual investor can effectively control the corporation. If the director has a problem, he or she can appeal to the controlling shareholder. 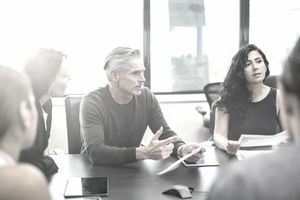 In a company where no controlling shareholder exists, the directors should act as if one did exist and attempt to protect this imaginary entity at all times (even if it means firing the CEO, making changes to the structure that are unpopular with management, or turning down acquisitions because they are too pricey). In a relatively few number of companies, the controlling shareholder also serves as the CEO and/or Chairman of the Board. In this case, a director is completely at the will of the owner and has no effective way to override his or her decisions. Are corporations people?